Our House is my roommates favorite pizza spot in Baltimore. She tries to talk me into going there for dinner at least once a week, if not more. My review from one of our many dinner visits can be found here. After a night of drinking, we were both in the mood for pizza to cure our hangovers. I remembered that Our House has a brunch menu so much to my roommates delight, I suggested heading over to Locust Point. For brunch, you can also order off the regular menu. Unfortunately Our House was out of their pretzels which is our favorite item on their menu. We did start with an order of their delicious garlic bread. My roommate is committed to her favorite pizza and ordered the Our House BOTH Cheese Pizza. This pizza had pizza sauce, parmesan cheese and mozzarella cheese. It’s her favorite and she ordered it on our other visit. I decided to try something a little different and order a breakfast pizza, I ordered the Our House Fluffy. It was their delicious pizza crust with parmesan cheese, scrambled eggs, bacon and mozzarella cheese. This pizza was great and really hit the spot to help cure my hangover. 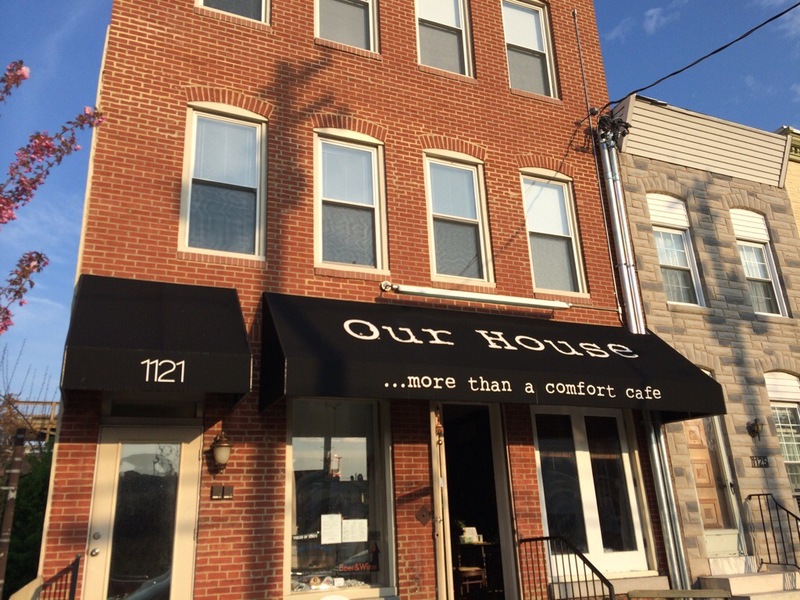 If you’re in Baltimore looking for great deep dish pizza in a relaxed, comfortable environment, anytime of day, I would highly suggest checking out Our House in Locust Point.